Toned. It’s exercise-speak for “looking fit, but not buff.” It’s that coveted status among fitness seekers, and a valuable buzz word for publishers looking to sell magazines. 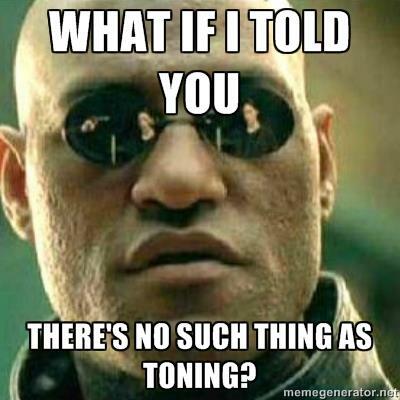 As a personal trainer, the word “toning” pops up frequently when I ask new clients about their fitness goals. It’s a word that has become a compulsory part of the “let’s get in shape” vernacular, one that can be applied to almost any part of the body to describe the state in which one is fit without being bulky. But what is toning, really, if not a self-diagnosis from clients who are afraid to look like the Incredible Hulk? In a nutshell, toning is a lowering of body fat to reveal the muscle underneath, and there actually being muscle underneath. Get it? More often than not, the muscle has shape, it’s just covered by excess calories so you can’t see it. If I took the biggest meat castle in the gym and put an extra 10% body fat on him, you’d see a reduction in toning. Sweet, so if I just diet, I’ll get toned, right? Wrong. When you’re dieting, the body tends to lose muscle as it loses fat. This creates that “skinny fat” look you sometimes see in those fancy types who think sweating is gross. Sure, they have less fat, but they also have less muscle. The result? Not toned. No workout + Diet = less muscle and less fat. Same perceived level of toning, just with smaller size. Workout + No Diet = more muscle and the same amount of fat. Same perceived level of toning but now with bigger arms that you hate and you blame your trainer for making you look like Miss Olympia. Workout + Diet = EQUAL muscle and less body fat (since you’ll be losing muscle as you lose fat but then gaining it back as you work out for a zero sum loss). Also known as nirvana, mecca, the golden ticket, the big dance, the bee’s knees… You get the idea. So why don’t the magazines give you this breakdown? Well, they need to keep selling magazines. So they forego the nutrition stuff and just repurpose workout tips and tricks, which are valuable but only effective in achieving “toned” body parts if paired with a good diet. Listen, I’m sorry if this hurts like that time your older cousin told you the Easter Bunny was a fraud. But someday you’ll thank me. Wake up, hit the gym, go all-out. Hydrate with some Gatorade because there’s no time for breakfast and you want to see if your sweat runs purple like they show in the commercials. Skip the morning snack and chew some sugar free gum instead. Grab a Shake Weight (or ThighMaster, pick your poison) during that boring conference call. Overworking yourself at the gym. Heard of burnout? Skipping breakfast, which isn’t deemed “the most important meal of the day” for nothing. Chasing your sugar water with sugar-free chemicals. Okay, okay, that sounds a little dramatic. I know. Here’s the real breakdown of these five fitness myths. 1. No pain, no gain. Look, leaving everything on the floor is for singing competitions, not your regular fitness routine. The fact is, if you overwork yourself so that you’re too sore to go back the next day, you’re not setting yourself up for success. Easy does it, Grasshopper. 2. There are two grades of sports drinks. Nobody’s sweat is purple. In fact, the athletes you see actually drinking Gatorade are drinking a diluted version of it. The high-octane stuff is consumer-grade, and a much less healthy option than, say, water. 3. “As seen on TV.” Unless it’s a Sham-Wow, you should be skeptical. While the Shake Weight promises to isolate those pesky bat wings and Suzanne Somers swears by the ThighMaster, these gadgets and gimmicks won’t isolate a single fatty area. If you’re going to lose fat, you’re going to lose it all over. 4. Put down the sugar-free gum. Now back away slowly. “Sugar-free” is code for “chemicals added” and trust me, the chemicals have side effects that will work against you. 5. Skipping breakfast will put your metabolism – and your weight loss – on a roller coaster. Creating that huge time gap between dinner the night before and your next meal (lunch) will set you up for making bad decisions. Ever gone to the grocery store hungry and walked out having spent an entire paycheck and given your phone number to the butcher? Yeah. Same thing. We make bad choices when we’re hungry. The path to weight loss and fitness is strewn with booby traps like infomercials and images of chiseled athletes with performance enhancements to share. But really, simple is better – eat breakfast, don’t kill yourself in the gym, drink water and treat yourself well.